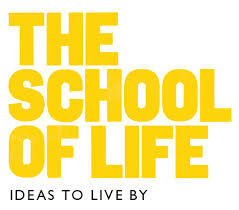 Now, here’s an interesting one: The School of Life. An organisation that devoted itself to developing emotional intelligence. Sounds a bit esoteric? They offer a wider variety of surprisingly sensible programmes and services with the focus being on how to live thoughtfully, wisely and well. The organisation was originally founded in 2008 in swinging Londontown and has since grown to spread its operations via Paris, Amsterdam, London, Melbourne, Antwerp, Belgrade, Instanbul and Sydney. Apart from offering classes, workshops, retreats, intensives, secular sermons, and therapies in the third dimension and through facilitating it themselves, they publish books, an arm of the operation that shall form the focus of this feature. What is refreshing about School of Life’s approach to publishing is that they are not trying to corner you with dogmas, au contraire: The tenet is to get you thinking and to provoke a process that will let you come to your own conclusion. This is something I can attests to, as I have had a chance to read a range of their books on different topics and the way it is presented is holistic, matter-of-factly, undogmatic yet offers a gentle guidance for those in need thereof. Claiming that The School of Life’s offerings are diverse is an understatement par excellence – from philosophy to literature via psychology to the visual arts – nothing is off limits and somehow they manage to block out the white noise of a world overflowing with information and distil and boil down relevant matters down to their essence without falling prey to becoming an overbearing preachy voice that batters you with its ideological contracts. School of Life’s emissions are stimulating, encouraging and their careful curation helps to weed out a lot of unnecessary elaborations as somehow their range of writers find their own distinctive voice with writings being structured according to the situations of your own life. Different angles are taken and while some of them might not be your preferred ones, they more often than not resonate, lend perspective and with their calm and reasonable voice encourage you to leave your limitations behind and expand your horizon. For a lack of a singular, fitting term, I find the School of Life to be a repository of attitudes that are elusive, but much needed, as they are here to stay and meant to be revisited.